At the very top of my list of ‘Things that make me happy‘, is a well planned out night, filled with lots of goodies, all while in great company. I was pressured to sit into a chair at an effortless ‘300’ (movie) booth at The Motorcycle Show at the Direct Energy Centre. Shown three stencils, I hesitantly looked over the three and nodded to the most subtle one. I felt my left sleeve being pulled up, exposing my inner forearm and watched the brisk 15 second spray of a pretty damn tacky airbrush tattoo come together. I stood up, glanced down at the new vibrant addition and reconsidered the worth of walking down here. There must have been something more to this. Spotting out a ballot box for – something something to do with 300, I filled in my full name and email, folded it in half and dropped it into the box, then made my way back to work. The evening started off with a pair of tickets to the ‘300: The Rise of the Empire‘ screening. I was probably the only non-fan, having my friend fill me in on the history of each character as each appeared. I spent the next two hours trying to be amused, but, the IMAX experience of blood splattering onto your shades quickly got old, and I was pretty relieved once it ended. Phase two of the night got us onto a Subway to Bathurst and Bloor, a chilly walk landed us infront of Famoso Neapolitan Pizzeria. 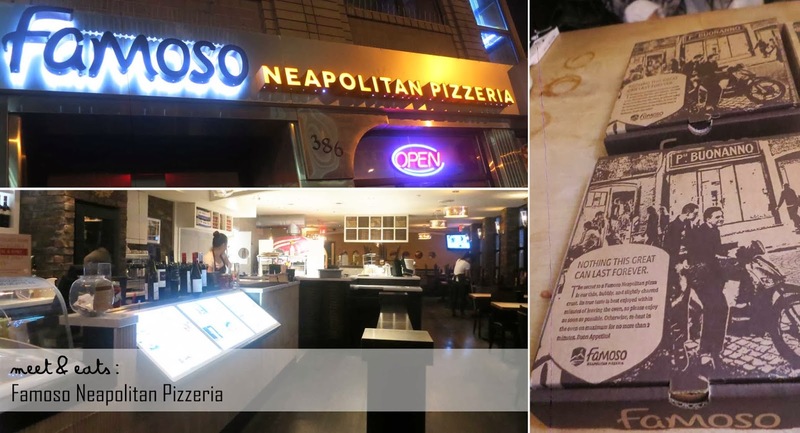 Famoso Neapolitan Pizzeria is really, the perfect place for a date. The seating was so cozy, and the lighting was just right. The next few hours were spent piecing ourselves together. It’s really nights like these that keep me on track. Fior-di-latte wrapped with Prosciutto, baked in Campania Tomato sauce, fresh Basil, and Pecorino Romano. Served with Flatbread. Prosciutto Wrapped ANYTHING is a no-brainer. But, Mozzarella Balls??? Hold up. I only expected more cheesy-gooey-ness to go on, but the tomato sauce was a delicious slurp, and I wanted a much softer flat bread. 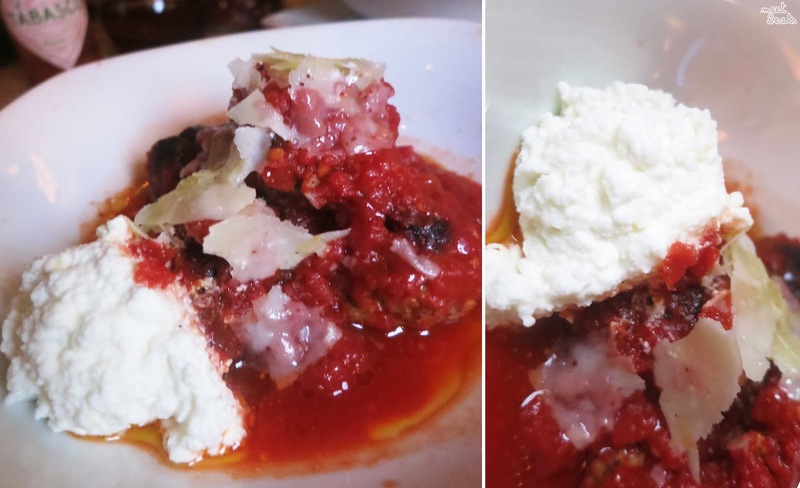 House-made spiced Pork Meatballs, Campania Tomato sauce, Ricotta, shaved Grana Padano, extra Virgin Olive Oil. Good stuff. Seriously, not idea what these words are, but I liked the bites of these, perfectly spiced, but not perfectly sized. 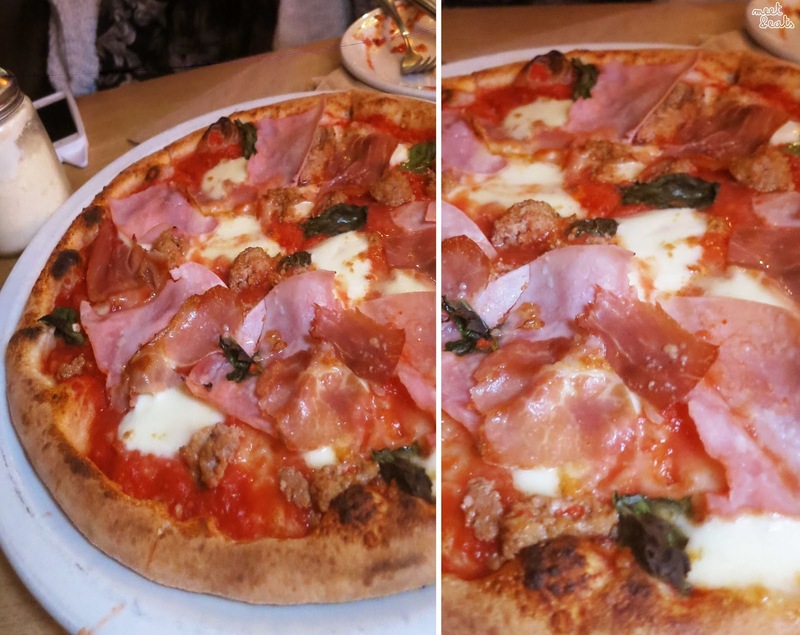 Oven-roasted Italian Sausage, Italian Ham, baked Prosciutto, Pecorino Romano. Great pizza! Wood-fired at 90-seconds, so crispy and chewy. My tastebuds were longing for more meat though. The whole dinner was fabulous! 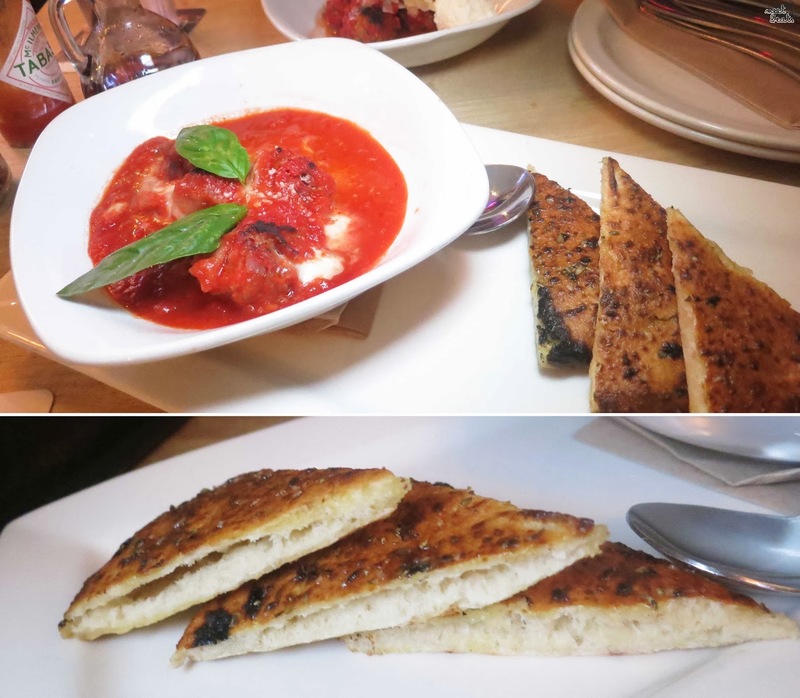 The Siciliana Pizza was great, and I never got sick of the Meatballs – unintentionally ordering two appetizers of meatballs, with no regret! I do want to try one of the ‘White’ Pizzas next time around. And, one of their many, many rows of Gelato.